We have been preparing for those lovely DIBELS progress monitoring tests, getting kids ready for that phoneme segmentation and nonsense word assessment! So here was a fun activity that I put together for my kiddos. The first thing that I did was to call out several CVC words, some real and some nonsense words. The kids wrote the words on pieces of candy corn - one sound in each section of the candy. This was a fun review for some phoneme segmentation. We segmented the sounds in the words and then wrote the sounds. After we wrote all of our words, the kids sorted their real and nonsense words. 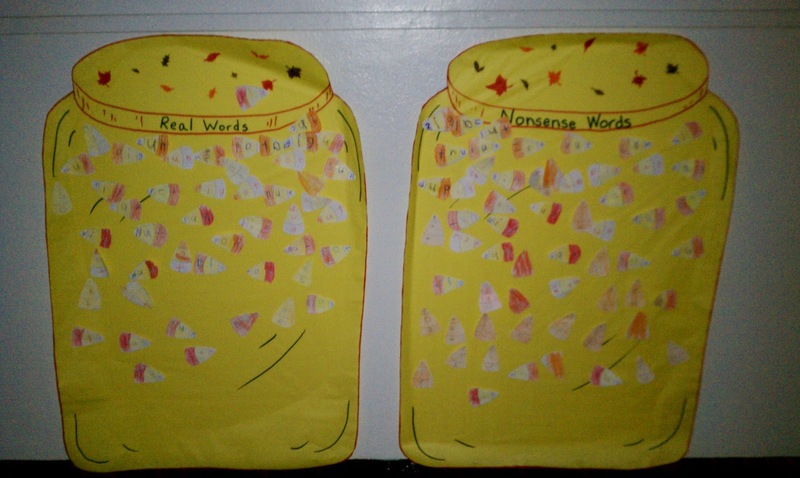 Then we taped them onto our candy jars and reviewed all of the words in each jar. I just found your blog...I love finding other 1st grade blogs to stalk. Be sure and add a follow button when you get the chance. Go to design at the top of your blog and then layout. Choose add a gadget and the follow box is the 9th one. Thank you so much! I am still learning how to do all of this stuff and appreciate the help! I would love to check out your blog too!